Plans have been submitted by Northline Development to renovate one of Midtown's biggest eyesores, the old Transmissions R' Us property at NW 10th and Harvey. Northline has the property under contract with a closing date in the near future. 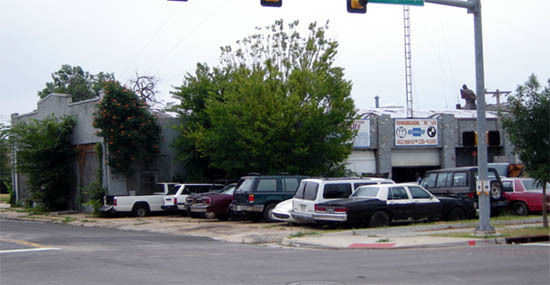 The property has been the subject of controversy for the storing of many inoperable cars in it's main parking lot facing the booming 10th Street corridor. Recently, the owners bowed to pressure from the City of Oklahoma City and removed all the autos some time ago. Much like the Swanson's Tire project directly to the southwest, Northline plans to leave the orginal structure in tact but completely renovation including a new roof, replacing the six overhead doors with modern glass versions, and completely replacing the front drive. The remaining large windows will be replaced with steel casement windows. Northline will actively market the 12,000 square feet of space to restaurants and retail tenants and renderings show a patio facing NW 10th. The project is directly south of the popular Bleu Garten food truck court, and located in the middle of a thriving 10th Street, with many new bars, restaurants and retail tenants set to join an already large number of the same: McNellie's, Fassler Hall / Dust Bowl, R&J Supper Club, Barrios (coming to the Swanson's Tire devleopment) Broadway 10, Sidecar, Packard's, Nic's Diner, The Garage Hatch, Twisted Spike Brewery and Kamp's 1910. Renovation would start after closing and after obtaining necessary approval from the Downtown Design Review Committee. Pete, who makes up Northline? To quote everyone's fav candidate, this will be huuuuuge. Always thought this building had potential, and the location will bridge Dust Bowl and Packard's. Vicent Le and Kayla Baker. They have done a bunch of homes in SoSA and will be doing the Dwellings at SoSA as well. I've been hoping this building would finally get renovated for a long time. Major potential. Big, big deal and some welcome good news. Steve's update along with a video interview with Kayler Baker with Northline Development. 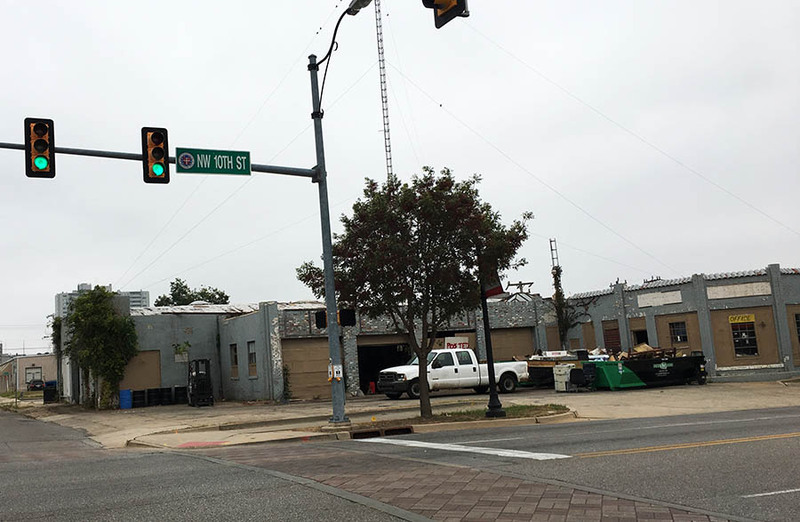 OKLAHOMA CITY – Northline Development partners Vincent Le and Kayla Baker are ready to start renovating the former vehicle repair shop at 308 NW 10th St. But they still need owner Ahmad Bahreini to clean out the building. Le said Bahreini now says he’ll start on the 12,594-square-foot building this weekend. If that happens, Le said the sale will close in late July. Exterior work will begin when Northline gets the title. The Downtown Design Review Committee approved the exterior renovations at its Thursday meeting. Utopia Design Build architect Frank Hawes’ plans are to replace the existing windows and doors with storefront glazing, replace existing garage doors with full-view operational garage doors, fill two openings with brick, repaint the brick, repair the damaged mortar and stucco, and replace surface concrete. Hawes said he’s waiting on the cleanout before creating an interior plan. Baker said the 1920s-era facility’s interior has exposed brick, skylights and a sliding barn door. She said two restaurants will fill the space, but she and Le couldn’t give any hints on the eateries. Baker said they started talking to Bahreini about 10 months ago regarding the building. They first met him when they purchased another one of his properties in Midtown. Once they secured that purchase, they inquired about the facility at 10th and N. Harvey Avenue. With car parts stacked inside, some of the care will include cleaning up any environmental issues. Le said they had phase 1 and phase 2 in environmental work completed. He said there is only about $20,000 in cleanup needed. “That’s not bad at all,” he said. When Northline gains ownership, Le said it will be another six months of build-out before the restaurants open. He said the building will have new tenants by February 2017. I can't say I'm too surprised that the seller isn't moving on this. I believe he has had multiple offers but on this property but doesn't want to put forth the effort to clean this place up. Hopefully he will and the sell goes through. Ownership has still not transferred as the current owner had to first clear out tons of junky cars and such. However, my understanding is a lot of that has been done and they hope to close in about a month. Afterwards, renovation will begin in earnest. Do they have any tenants lined up, or is it too early in the game for that? They do have at least one restaurant but I can't divulge just yet. Will be cool and different. Make your own pizza place? It looks like they are finally cleaning this place out. There are a couple of guys who have been loading up a f-250 with parts. A small dumpster was dropped off this week. Hopefully this means the sale will be going through sooner rather than later. Yes, they started to finally get serious a couple of weeks ago. Property can't close until it's cleared out. Perhaps another 30 days or so, then work should start shortly after closing. They finally closed on this property, so things should start moving forward very soon. Great news! his is such a visible corner it will be nice to see the eye sore transformed into another great project. will really do wonders for the look of 10th street. They had to have been moving stuff out of that building for over 3 months. I was amazed with things that were coming out of there. No, not yet but hopefully soon. What's up at 2826 NW 10th?